This fairy tale castle is set on the northern tip of the Isle of Mull. As the road winds out of Tobermory, the castle appears suddenly against the Atlantic and Outer Isles. It was this setting that took the fancy of James Forsyth who built this Victorian castle during the clearances when the population of Mull fell from its peak of 25,000. The castle was completed in 1860, with Forsyth never living to see his finished work. It was designed to be dramatic and impressive and to this day it is still stunning both in style and setting. 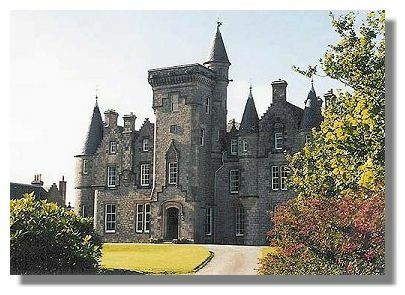 Since its completion, the castle has been through a succession of owners that reflects the history of Scottish land ownership through the 20th century. Initially built as a grand Victorian castle, it was sold in the early 20th century more for its potential for hunting and fishing than for the property itself. Now it contains many quarters that are self-catering apartments that are rented throughout the year. It also offers 4-star bed and breakfast accommodation - as well as running the original walled garden as the island's main producer of fresh food for its hotels, shops and restaurants. See the Glengorm Castle Website for more information and bookings. or go to the next castle: Hailes Castle.